Closure of ATP-regulated K+ channels (KATP channels) plays a central role in glucose-stimulated insulin secretion in beta cells. KATP channels are also highly expressed in glucagon-producing alpha cells, where their function remains unresolved. Under hypoglycaemic conditions, KATP channels are open in alpha cells but their activity is low and only ~1% of that in beta cells. Like beta cells, alpha cells respond to hyperglycaemia with KATP channel closure, membrane depolarisation and stimulation of action potential firing. Yet, hyperglycaemia reciprocally regulates glucagon (inhibition) and insulin secretion (stimulation). Here we discuss how this conundrum can be resolved and how reduced KATP channel activity, via membrane depolarisation, paradoxically reduces alpha cell Ca2+ entry and glucagon exocytosis. Finally, we consider whether the glucagon secretory defects associated with diabetes can be attributed to impaired KATP channel regulation and discuss the potential for remedial pharmacological intervention using sulfonylureas. Glucagon, secreted by the pancreatic alpha cells of the pancreatic islets, is the body’s principal hyperglycaemic hormone [1, 2]. Together with insulin, glucagon ensures that plasma glucose levels are kept within a narrow range by accelerating hepatic glucose production via stimulation of glycogenolysis , regardless of eating, exercise and fasting . Glucagon secretion is triggered by amino acids, fatty acids, neurotransmitters (such as adrenaline [epinephrine] and gastric inhibitory polypeptide [GIP]) , but a fall in plasma glucose levels arguably represents the physiologically most important physiological stimulus. 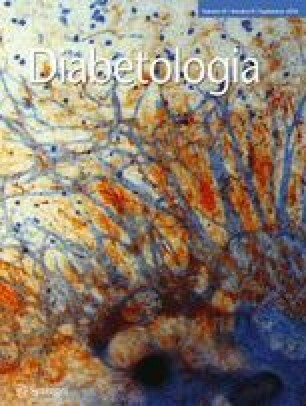 Interest in the regulation of glucagon secretion has been renewed by the recent rediscovery of the central role of glucagon in diabetes. Thus, over-secretion of glucagon at high plasma glucose levels exacerbates the hyperglycaemia caused by the lack of insulin . The finding that mice remain normoglycaemic even after complete destruction of their beta cells if glucagon action is prevented  provides a spectacular demonstration of the contribution of glucagon to the hyperglycaemia seen in diabetes. Regulation of glucagon secretion: intrinsic, paracrine or both? The metabolic regulation of glucagon secretion remains hotly debated. A central question is whether the alpha cells are capable of sensing changes in the plasma glucose levels by themselves (‘intrinsic regulation’)  or if they are regulated by factors released from neighbouring endocrine cells (‘paracrine regulation’) . The fact that insulin and glucagon secretion are reciprocally regulated by glucose gave rise to the idea that glucagon secretion is under paracrine control by insulin (the ‘switch-off’ hypothesis) [9, 10]. The switch-off hypothesis is attractive as it provides a simple explanation for the hypersecretion of glucagon seen in diabetes (when insulin secretion is low) and why this is corrected by administration of exogenous insulin. Variations on this theme postulate that the inhibitory effect of high glucose on alpha cells is mediated by factors co-released with insulin from the beta cells (like γ-aminobutyric acid [GABA] , Zn2+  or γ-hydroxybutyrate [GHB] ). In addition, there is strong evidence that glucagon secretion is under vagal regulation [14, 15]. However, a problem with the switch-off hypothesis is that glucagon secretion is almost maximally inhibited at glucose concentrations that do not stimulate insulin secretion . This is highlighted by the data in Fig. 1, which summarises the time- and concentration-dependent effects of glucose on insulin and glucagon secretion measured in a perfused mouse pancreas preparation. Increasing the glucose concentration from 1 to 6 mmol/l reduced glucagon secretion by 60–70%. It is notable that glucagon secretion remained equally suppressed during the first and second phases of insulin secretion and that inhibition peaked before any detectable stimulation of insulin secretion. Moreover, increasing the glucose level from 6 to 20 mmol/l resulted in much stronger stimulation of insulin secretion (approximately tenfold higher than steady-state release at 6 mmol/l) but this did not translate into further inhibition of glucagon secretion. The dissociation between insulin signalling and glucagon secretion is also supported by the surprisingly mild effects on glucagon secretion observed following genetic ablation of the insulin receptors in the alpha cells [17, 18]. The findings that glucose remains capable of inhibiting glucagon secretion in somatostatin-deficient islets  and in the presence of somatostatin receptor antagonists  also suggest that somatostatin released by the delta cells does not function as a ‘switch-off’ signal for glucagon release. Collectively, these data provide little evidence of a paracrine regulation of glucagon secretion by insulin at glucose concentrations at or below the threshold for stimulation of insulin or somatostatin release (6 mmol/l). However, we acknowledge that paracrine regulation may become functionally more significant at glucose concentrations associated with stronger stimulation of insulin or somatostatin secretion (or other factors released by the beta and delta cells). It should also be noted that isolated islets (when innervation has been severed) remain capable of responding to low glucose concentrations with stimulation of glucagon secretion. Like beta cells, alpha cells are electrically excitable. However, unlike beta cells, alpha cells fire action potentials [21, 22, 23] and exhibit spontaneous oscillations in intracellular Ca2+ concentrations ([Ca2+]i) at low (0–3 mmol/l) glucose concentrations [24, 25, 26]. The occurrence of spontaneous electrical activity and [Ca2+]i oscillations in alpha cells at low glucose levels is well established and explains why glucagon secretion is stimulated under hypoglycaemic conditions. However, the impact of higher glucose concentrations on glucagon secretion is more controversial. Some studies suggest that elevation of glucose levels hyperpolarises alpha cells  and lowers [Ca2+]i [28, 29, 30, 31]. Others have indicated that isolated alpha cells (obtained by fluorescence-activated cell sorting [FACS]) behave like beta cells, i.e. they are electrically silent with low [Ca2+]i at low glucose levels, but elevation of glucose triggers depolarisation, electrical activity and elevation of [Ca2+]i . Finally, there are reports suggesting little effect of glucose on [Ca2+]i in intact islets [24, 33]. The latter finding has led to the proposal that the regulation of glucagon granule release may be exerted at a late stage in the alpha cell stimulus–secretion coupling, distal to the elevation of [Ca2+]i . The above summary may not be a comprehensive review of the literature, but the intention here is rather to highlight the great variability of the reported responses to glucose. We have developed techniques that allow patch-clamp studies of freshly isolated intact islets . Fig. 2 shows measurements of [Ca2+]i and electrical activity from alpha cells using this preparation. Bursts of increased [Ca2+]i are present at 1 mmol/l glucose (when glucagon secretion is stimulated), but elevation of glucose to 6 mmol/l, a maximally inhibitory concentration (see Fig. 1), is not associated with any detectable reduction of [Ca2+]i (Fig. 2a). Unexpectedly, elevation of glucose depolarised the alpha cell by ~10 mV and doubled the rate of action potential firing (Fig. 2b). In hormone release experiments in groups of isolated islets prepared the same way as those used for electrophysiology, 6 mmol/l glucose consistently inhibited glucagon secretion by ~50% . This effect is quantitatively similar to those observed in the perfused pancreas, suggesting that islet function was not compromised during isolation. Our in situ measurements of alpha cell electrical activity and [Ca2+]i therefore suggest a dissociation between these processes and glucagon secretion. A possible resolution of this conundrum is outlined below. Glucose metabolism in glucagon-secreting alpha cells differs from that in beta cells in several important respects. First, glucose uptake is mediated by GLUT1 rather than GLUT2 . Second, although alpha cells (like beta cells) express high-K m glucokinase (GCK; hexokinase IV), they also express the low-K m hexokinase II, which accounts for ~50% of glucose phosphorylation in alpha cells vs <10% in beta cells . Third, whereas the rates of glucose utilisation (glycolysis + Krebs cycle) are comparable in alpha and beta cells , the rate of glucose oxidation (oxidative phosphorylation alone) in alpha cells is only ~10% of that in beta cells . Time-resolved but non-quantitative measurements of the cytoplasmic ATP concentration have revealed that elevation of glucose induces a prompt increase in ATP [26, 33]. Quantitative biochemical measurements of ATP and ADP in pure alpha and beta cell fractions further suggest that the ATP/ADP ratio in alpha cells at 1 mmol/l glucose is as high as that in beta cells exposed to 6 mmol/l glucose . It is interesting to correlate this information on alpha cell metabolism with the effects of various metabolic inhibitors on glucagon secretion. Thus, 3-O-methyl-d-glucose, a glucose analogue that is transported into the cell but not metabolised, does not influence glucagon secretion . Mannoheptulose, an inhibitor of GCK, prevents the glucose-induced suppression of glucagon secretion . The effects of mitochondrial inhibitors (such as oligomycin  and dinitrophenol ) are complex; in the presence of mitochondrial inhibitors, glucagon secretion is stimulated at high glucose levels but inhibited at low glucose concentrations. Thus, alpha cells in which mitochondrial metabolism has been inhibited retain the ability to respond to glucose, albeit in the ‘wrong’ direction, raising the interesting possibility that glycolysis plays a more prominent regulatory role in glucagon secretion than in insulin secretion. The electrophysiological properties of any given cell are determined by its ion channel complement. In this section we briefly outline how the different ion channels contribute to electrical activity in mouse and human alpha and beta cells. Pancreatic beta cells exposed to low glucose are hyperpolarised (−70 mV) and electrically silent. This is because the ATP-regulated K+ (KATP) channel activity is very high (3 nS; corresponding to ~300 KATP channels being simultaneously active). When glucose is elevated to >6 mmol/l, KATP channel activity is reduced by >75% and the cells depolarise. Importantly, KATP channel closure alone is not sufficient to produce membrane depolarisation; a depolarising membrane current is also required . Possible candidates include members of transient receptor potential (TRP) channel family (for a review, see ). The glucose-induced depolarisation leads to the activation of voltage-gated Ca2+ channels (principally dihydropyridine-sensitive L-type Ca2+ channels) . Activation of the L-type Ca2+ channels during action potential firing produces a localised increase in [Ca2+]i just below the plasma membrane and near the Ca2+ channels, which thereby triggers exocytosis of insulin granules, some of which may be physically tethered to the Ca2+ channels . Although there are several important electrophysiological differences between mouse and human beta cells, the fundamental aspects of glucose sensing are the same . As already discussed, mouse alpha cells are electrically active at 1 mmol/l glucose and fire action potentials from a membrane potential of approx. −55 mV [26, 44]. The alpha cells are equipped with KATP channels of exactly the same type as those found in beta cells but their net activity is limited to ~0.1 nS (approximately eight simultaneously active channels). As a consequence of the low KATP channel activity, alpha cells have a very high input resistance (3–5 GΩ) [26, 44]. This means currents as small as 1–2 pA (equivalent to the current associated with openings of individual ion channels) will change the membrane potential by 3–10 mV. Thus, small changes in ion channel activity may have dramatic effects on membrane potential, action potential firing and glucagon secretion. The upstroke of the action potential in mouse alpha cells is due to the opening of voltage-gated Na+ channels . During the peak of the action potential, voltage-gated Ca2+ channels activate. The magnitude of the Ca2+ current is only ~15% of the Na+ current [45, 46], and blocking the Na+ channels exerts a strong inhibitory effect on both alpha cell electrical activity and glucagon secretion . In mouse alpha cells, ~70% of the Ca2+ current flows through L-type Ca2+ channels and only ~20% is due to opening P/Q-type Ca2+ channels [26, 44]. Nevertheless, hormone release measurements using the P/Q-type Ca2+ channel inhibitor ω-agatoxin1 indicate that the P/Q-type Ca2+ channels are particularly important for glucagon secretion evoked by low glucose concentrations . In addition, mouse alpha cells express low-threshold T-type Ca2+ channels that may be involved in the initiation (‘pace-making’) of action potential firing [47, 48]. Increasing glucose to ≥6 mmol/l results in complete inhibition of the already low KATP channel activity. As discussed above, this leads to a membrane depolarisation of ~10 mV . As in beta cells, this depolarisation requires a depolarising membrane current. The identity of this current in alpha cells remains unknown but a store-operated membrane conductance discussed below could potentially be involved. Crucially, elevation of glucose is not only associated with an increased rate of action potential firing, there is also a reduction in action potential height (Fig. 2). The latter effect occurs because the voltage-gated Na+ channels underlying the upstroke undergo voltage-dependent inactivation and thereby become non-functional. At the most negative membrane potential, observed at 1 mmol/l glucose, 75% of the Na+ channels remain available for activation. This decreases to 30% in the presence of 6 mmol/l glucose. The reduction in the proportion of Na+ channels available for spike generation explains the lowered action potential amplitude. This is important because the P/Q-type Ca2+ channels that mediate the Ca2+ influx triggering glucagon exocytosis principally activate at the peak of the action potential. Reactivation of the Na+ channels occurs during the interval between two successive action potentials and the inter-spike membrane potential, which in turn is influenced by the number of voltage-dependent K+ channels activated during the action potential; the stronger the activation of K+ channels, the more negative the inter-spike membrane potential and the greater the reactivation of Na+ channels. This may explain the paradox that blocking voltage-gated K+ channels in alpha cells is associated with inhibition of glucagon secretion and electrical activity rather than the stimulation seen in beta cells [49, 50, 51]. Electrophysiologically, human alpha cells are almost identical to human beta cells [51, 52]. Yet, glucose has opposite effects on insulin and glucagon secretion. Importantly, KATP channel activity in isolated human alpha cells exposed to 1 mmol/l glucose is 75% lower than in beta cells under the same experimental conditions  and is in fact comparable to that in human beta cells exposed to insulin-releasing glucose concentrations, which probably explains the occurrence of spontaneous action potential firing in alpha cells under hypoglycaemic conditions. The net KATP channel activity in human alpha cells (after subtraction of unspecific leak currents around the recording electrode) is equivalent to one KATP channel being active at any time in the entire alpha cell. Such low KATP channel activities are not easily measured experimentally. However, the finding that the KATP channel blocker tolbutamide depolarised human alpha cells by ~10 mV, reduced action potential height by ~10 mV  and inhibited glucagon secretion in human islets  indicates that even a KATP channel activity as low as this is sufficient to keep the alpha cell sufficiently repolarised to maintain action potential height and glucagon exocytosis. It remains to be demonstrated experimentally that glucose also reduces KATP channel activity in human alpha cells. Circumstantial evidence that glucose regulates glucagon secretion in human islets by closing KATP channels has been provided by the observation that the inhibitory effect of glucose on glucagon secretion can be reversed by low concentrations of the KATP channel activator diazoxide (2–3 μmol/l) [16, 26]. The key role of the KATP channels in the regulation of glucagon secretion is further illustrated by the strong reduction of glucagon secretion at low glucose concentrations and the (nearly complete) loss of glucose-induced suppression following genetic ablation of the KATP channels [16, 19, 53, 54, 55]. It has previously been reported that incubation of isolated mouse  and human islets  at high glucose concentrations (>20 mmol/l) results in a less effective inhibition of glucagon secretion than lower (5–8 mmol/l) glucose concentrations. Interestingly, in KATP channel knockout mice, we found that increasing glucose stimulated glucagon secretion in a concentration-dependent manner. Thus, glucose appears to control glucagon secretion by both KATP channel-dependent (inhibition) and -independent (stimulation) processes (Fig. 3a). This is reminiscent of the situation in beta cells , with the important difference that the KATP channel-dependent (‘triggering’) and -independent (‘amplifying’) effects on insulin secretion are both stimulatory (Fig. 3b), whereas they have opposing effects on glucagon secretion. The nature of the KATP channel-independent stimulation of glucagon secretion remains to be elucidated, but it is noteworthy that glucose has been reported to amplify depolarisation-evoked exocytosis in voltage-clamped rat alpha cells . In addition to the KATP channel-dependent mechanism for intrinsic glucose-induced inhibition of glucagon secretion we outline above, it has been postulated that glucose regulates glucagon secretion via a store-operated Ca2+ current flowing through Orai1 channels . According to this hypothesis, elevation of glucose will activate the sarco-endoplasmic reticulum (sER) Ca2+-ATPase (SERCA). When the Ca2+ stores are filled, the Orai1 channels will be turned off, leading to alpha cell hyperpolarisation, cessation of action potential firing and suppression of glucagon secretion. The Orai1-dependent mechanism has recently been reviewed elsewhere . It is noteworthy that the KATP channel- and Orai1-dependent mechanisms for the intrinsic regulation of glucagon secretion predict opposite effects on the alpha cell membrane potential [60, 61]. Our data showing that glucose depolarises rather than repolarises the alpha cell are not consistent with a major role of Orai1 in glucagon secretion, but this does not exclude a modulatory role. Indeed, we have found that the SERCA inhibitor thapsigargin partially antagonises the inhibitory effect on glucagon secretion . Further studies are required to determine the relative importance of the KATP channel and Orai1-dependent regulation of glucagon secretion. Why does glucose stimulate insulin secretion but inhibit glucagon secretion? In alpha cells and beta cells, elevation of glucose produces membrane depolarisation and increases action potential frequency. Why then does glucose inhibit glucagon secretion whilst stimulating insulin secretion? There is a simple explanation to this conundrum, illustrated schematically in Fig. 4. In beta cells, action potential firing and insulin secretion at low glucose concentrations are virtually zero. When glucose is elevated, glucose-induced electrical activity initiates insulin secretion from a very low basal level. Although the action potential amplitude often undergoes a time-dependent decrease (leading to a gradual reduction of Ca2+-dependent exocytosis ), insulin secretion will remain much above basal levels even after this has occurred (Fig. 4a). Under hypoglycaemic conditions, alpha cells generate large-amplitude Na+-dependent action potentials and this, via Ca2+ entry through P/Q-type Ca2+ channels, accounts for the high basal rate of glucagon secretion. As in beta cells, elevation of glucose leads to membrane depolarisation and an increased rate of action potential firing. However, the increase in action potential firing is fairly moderate and limited to an increase of 100%. In addition to the effect on action potential frequency, as discussed above, glucose has another very important effect: it produces a reduction in action potential height, which results in diminished glucagon granule exocytosis. We estimate that the 10 mV decrease in action potential amplitude we observe (Fig. 2b), via reduced P/Q-type Ca2+ channel activation, results in 80% inhibition of glucagon exocytosis. The associated increase in action potential frequency is insufficient to compensate for the much greater reduction of exocytosis. Combining these two effects it is predicted that glucose should inhibit glucagon secretion by ~60% (Fig. 4b), which is very close to the inhibition observed experimentally (see Fig. 1). This scenario would also explain the paradox that in alpha cells glucose (6 mmol/l) has little effect on [Ca2+]i whilst inhibiting glucagon secretion; the increase in action potential frequency leads to increased Ca2+ influx via L-type Ca2+ channels that partially compensates for the reduced activation of P/Q-type Ca2+ channels because of the lower action potential height on [Ca2+]i (but not on glucagon secretion). Interestingly, stronger inhibitory effects on alpha cell [Ca2+]i in intact islets have been reported at higher glucose concentrations (11 mmol/l) [16, 30], possibly reflecting stronger paracrine suppression owing to greater stimulation of insulin and/or somatostatin release. The capacity of glucagon-like peptide 1 (GLP-1) to inhibit glucagon secretion  has also been attributed to an intrinsic mechanism (but see  for an alternative paracrine viewpoint) that culminates in reduced activation of alpha cell P/Q-type Ca2+ channels . The latter effect is mediated by direct protein kinase A (PKA)-dependent inhibition of alpha cell P/Q-type Ca2+ channels  that is not secondary to changes in KATP channel activity and membrane potential. The scenario outlined in Fig. 4 emphasises the importance of a high rate of action potential firing and consequential stimulation of glucagon secretion in alpha cells exposed to low glucose concentrations resulting from low resting KATP channel activity. Importantly, the magnitude of the KATP current that can be activated by wash-out of intracellular ATP is, if anything, larger in alpha cells than in beta cells . Thus, the low KATP channel activity in alpha cells is not due to low expression of the channel. Rather, KATP channel activity must be under very strong tonic inhibition, possibly reflecting the high ATP/ADP ratio in alpha cells . Both human and mouse alpha cells contain P/Q as well as L-type voltage-gated Ca2+ channels [44, 51]. In mouse islets, blocking the L-type Ca2+ channels has little effect on glucagon secretion evoked by low glucose. By contrast, blocking the P/Q-type Ca2+ channel inhibits glucagon secretion as strongly as a maximally inhibitory glucose concentration [26, 51]. Thus, it appears that glucagon secretion evoked by low glucose is selectively triggered by Ca2+ entry via P/Q-type Ca2+ channels (20% of the Ca2+ current) and that Ca2+ entry via L-type Ca2+ channels (70% of the Ca2+ current) is seemingly unimportant in this context. How can this paradox be explained? To address this question we used high-resolution capacitance measurements of exocytosis (Fig. 5a) . In agreement with the glucagon secretion measurements, depolarisation-evoked exocytosis in alpha cells is inhibited by ω-agatoxin . We found that depolarisations with a duration as short as 10 ms, which is comparable to the duration of the alpha cell action potential, evoke significant exocytosis (Fig. 5b). Importantly, the intracellular diffusion of Ca2+ during such brief action potentials is very limited, so only glucagon granules situated in the immediate vicinity of the P/Q-type Ca2+ channels undergo exocytosis. This stimulation of exocytosis is mediated by Ca2+ binding to synaptotagmin-7, a Ca2+ sensor for exocytosis expressed in alpha cells . What is the function of the L-type Ca2+ channels in mouse alpha cells? Clearly they are not involved in exocytosis evoked by action potential firing under hypoglycaemic conditions. However, when glucagon secretion is stimulated by adrenaline (epinephrine; acting via β-receptors), glucagon secretion becomes almost entirely reliant on L-type Ca2+ channels [21, 65] (Fig. 5c). Adrenaline depolarises the alpha cells by ~10 mV and reduces the action potential height by >10 mV . Thus, the effects of adrenaline on electrical activity resemble those of glucose, and yet it stimulates rather than inhibits glucagon secretion. We believe that an adrenaline-induced increase in intracellular cAMP concentration ([cAMP]i)  counteracts the impact of membrane depolarisation/reduced action potential height on glucagon secretion. Via activation of PKA, which is cAMP-dependent, and the cAMP-sensor known as exchange protein directly activated by cAMP 2 (EPAC2), this increase in [cAMP]i culminates in (1) inhibition of P/Q-type Ca2+ channel activity, (2) stimulation of L-type Ca2+ channel activity, (3) mobilisation of Ca2+ from intracellular Ca2+ stores  and (4) sensitisation of exocytosis to [Ca2+]i . The combination of these effects accounts for the suppression of the P/Q-type Ca2+ channel-dependent component of glucagon secretion and concomitant enhancement of the L-type Ca2+ channel-dependent component. The latter effect is a consequence of the increased Ca2+ sensitivity of exocytosis which means that granules not immediately adjacent to the P/Q-type Ca2+ channels may also undergo release (Fig. 5d), accounting for a component of exocytosis that outlasts the duration of the depolarisation by >100 ms (Fig. 5b). Diabetes has been referred to as a ‘bihormonal disorder’ [70, 71], involving both inadequate insulin secretion and defective glucagon secretion. The defects in glucagon secretion include over-secretion at high glucose (when it is not needed) and inadequate release at low glucose (when it is needed) [72, 73]. Of course, the concept of diabetes as a bihormonal disorder does not imply that the hormonal defects are limited to insulin and glucagon secretion. Defects of glucagon secretion, similar to those previously observed clinically in patients with type 2 diabetes, are also observed in isolated islets. Thus, glucagon secretion at low glucose levels tends to be reduced and at high glucose levels islets from diabetic donors release more glucagon than islets from non-diabetic donors (Fig. 6a). These fairly dramatic changes in glucagon secretion are correlated with a reduction of ~30% in glucose-induced insulin secretion (Fig. 6b). Interestingly, the glucagon secretion defect associated with type 2 diabetes can be recapitulated by treating islets from non-diabetic donors with a low (2 μmol/l) concentration of the pharmacological KATP channel activator diazoxide (Fig. 6c), an experimental condition that increases the whole-cell KATP channel activity by as little as ~100 pS . At this concentration, diazoxide does not have much effect on glucose-induced insulin secretion (Fig. 6d and ) and somatostatin secretion . In the presence of 2 μmol/l diazoxide, glucagon secretion is strongly reduced at low glucose concentrations and increasing the glucose concentration stimulates rather than inhibits glucagon secretion. These observations raise the exciting possibility that the inverted glucose regulation of glucagon secretion seen in type 2 diabetes may be a consequence of a minute increase in alpha cell KATP channel activity. In this context it is also of interest that it has previously been reported that carriers of the activating KATP channel variant E23K exhibit reduced suppression of glucagon secretion during hyperglycaemia . An inverted glucagon secretion response to glucose was also seen in islets treated with oligomycin, an inhibitor of mitochondrial ATP synthase (Fig. 7a). In the presence of this mitochondrial inhibitor, glucagon secretion was reduced at low glucose concentrations and was stimulated rather than inhibited by elevated glucose levels. Importantly, normal glucose regulation of glucagon secretion in such metabolically compromised islets could be restored by a low tolbutamide concentration (10 μmol/l) (Fig. 7a). When a tenfold higher concentration of tolbutamide was used (100 μmol/l), glucagon secretion was strongly inhibited, regardless of the glucose concentration. In oligomycin-treated islets, glucose failed to stimulate insulin secretion and tolbutamide was without stimulatory effect (Fig. 7b). Thus, the normalisation of glucagon secretion produced by tolbutamide cannot be attributed to increased insulin release. These data suggest that the glucagon secretion defects associated with type 2 diabetes may be a consequence of increased KATP channel activity in the alpha cell. If this is the case, then it should be possible to correct the glucagon secretion defect seen in islets from type 2 diabetic organ donors with tolbutamide. This is indeed the case, and we have recently reported that 10 μmol/l tolbutamide restores normal glucose regulation in islets from diabetic donors . Figure 8 schematically summarises the regulation of electrical activity/glucagon secretion and how it depends on KATP channel activity. In healthy alpha cells (Fig. 8a), KATP channel activity at low glucose concentrations is very low but greater than 0. Under these conditions, the alpha cell membrane potential is sufficiently depolarised to allow action potential firing but negative enough to prevent inactivation of the voltage-gated Na+ channels. Thus, large-amplitude action potentials, associated with activation of P/Q-type Ca2+ channels and glucagon exocytosis, are generated. When glucose levels are elevated, KATP channels close and the alpha cell depolarises, which, as discussed above, results in voltage-dependent inactivation of the Na+ channels, lowered action potential height and reduced activation of the P/Q-type Ca2+ channels with resultant suppression of glucagon exocytosis. Based on the experiments using low concentrations of diazoxide, we postulate that KATP channel activity is slightly higher (+100%) in type 2 diabetic than in healthy alpha cells (Fig. 8b). The experiments with oligomycin suggest that this may be a consequence of impaired mitochondrial function. The increased KATP channel activity leads to a more negative alpha cell membrane potential, so that action potential firing at low glucose concentrations is either reduced or completely suppressed and glucagon secretion is correspondingly reduced. Despite the impaired mitochondrial metabolism, an increase in glucose remains capable of elevating the intracellular ATP/ADP ratio sufficiently to partially close the KATP channels. As a result, alpha cells depolarise, leading to increased action potential firing. This explains why glucagon secretion is stimulated rather than inhibited by glucose in type 2 diabetic islets. The electrophysiological and secretory responses shown here schematically have recently been substantiated by computational analyses . It has been reported that the Na+ current density in alpha cells from diabetic rats is twice as big as that in non-diabetic cells . Such an effect might also contribute to the over-secretion of glucagon at high glucose in patients with type 2 diabetes. This is because even after the Na+ channels have undergone partial voltage-dependent inactivation in response to glucose-induced depolarisation, remaining Na+ channel activity would be sufficient to ensure continued generation of full size action potentials. We have found that a low concentration of tolbutamide restores normal glucose regulation of glucagon secretion in islets from donors with type 2 diabetes. We used a concentration of 10 μmol/l, which is close to the level that reduces KATP channel activity by 50% . Thus, KATP channel activity in type 2 diabetic alpha cells exposed to tolbutamide is comparable to that seen in non-diabetic cells under hypoglycaemic conditions (Fig. 8c). Under these conditions, a further reduction in KATP channel activity produced by glucose can be expected to result in strong membrane depolarisation, reduced action potential height/Ca2+ entry and inhibition of glucagon secretion, similar to the responses in non-diabetic alpha cells (Fig. 8a). These observations suggest that low concentrations of sulfonylureas may help to restore normal glucose regulation of glucagon secretion in diabetic patients—both an increase at low glucose and a reduction at high glucose. It is important, however, that the dose of sulfonylureas is carefully titrated. Figure 8d explains schematically why this is the case. A high concentration of sulfonylureas will completely block KATP channel activity in the diabetic alpha cell. This will be associated with strong membrane depolarisation, reduced action potential height and suppression of glucagon exocytosis even at low glucose concentrations, and subsequent elevations of glucose will exert no additive effect. Sulfonylureas have previously been reported to inhibit glucagon secretion in vivo , and this was taken as an argument that glucagon secretion is suppressed by intra-islet insulin in a paracrine fashion. However, since sulfonylureas exert a direct effect on the alpha cells, it is equally likely that this effect reflects a direct effect mediated by closure of KATP channels in the alpha cells. In type 1 diabetes, it has been reported that sulfonylureas stimulate glucagon secretion [78, 79, 80]. This is reminiscent of what is observed in isolated rat alpha cells obtained by FACS. In these cells, KATP channel activity is increased 200% above that observed in alpha cells in freshly isolated intact mouse islets . There is also evidence that alpha cells are reprogrammed following destruction of the beta cells . It is possible that isolated alpha cells, as a consequence of the deprivation of factors released from beta cells (including insulin), have an increased KATP channel activity. Indeed, nucleotides and Ca2+ co-released with insulin potentiate insulin secretion in an autocrine fashion mediated by Gq/G11-coupled receptors . When this signalling was prevented by genetic ablation of Gq/G11, beta cell excitability was reduced via increased KATP channel activity. Similar mechanisms may become activated in alpha cells in type 1 diabetes or when alpha cells become separated from their beta cell neighbours, which would explain the observed increase in KATP channel activity that in turn explains why alpha cells adopt beta cell characteristics (such as being stimulated rather than inhibited by glucose or sulfonylureas). Here we argue that glucagon secretion is determined by KATP channel activity and that glucose-induced closure of these channels translates into suppression of glucagon secretion. The concept that increased KATP channel activity may explain the inverted glucose response and the loss of appropriate counter-regulation in diabetic patients has obvious therapeutic implications. It should be relatively easy to conduct a clinical study on the potential usefulness of low concentrations of sulfonylureas (lower than those required to stimulate insulin secretion ) with a view to restoring normal glucose regulation of glucagon secretion. Sulfonylurea-based therapy targeting glucagon secretion may therefore be particularly relevant in insulin-treated type 1 diabetic patients and in patients with type 2 diabetes managed by diet and/or insulin sensitisers. The non-L-type Ca2+ current component in mouse alpha cells was previously attributed to activation of ω-conotoxin-sensitive N-type Ca2+ channels. However, it was subsequently discovered that such channels are expressed at very low levels in alpha cells, whereas ω-agatoxin-sensitive P/Q-type Ca2+ channels are highly expressed. Pharmacological experiments revealed that ω-conotoxin had no effect on alpha cells Ca2+ currents in the presence of ω-agatoxin. We therefore conclude that ω-conotoxin unspecifically blocks P/Q-type Ca2+ channels in alpha cells. Here, non-L-type Ca2+ channels are therefore referred to as P/Q-type Ca2+ channels even when referred to as N-type in the original publications. We dedicate this review to the memory of our colleague Dr Matthias Braun (University of Alberta, Edmonton, AB, Canada) who unexpectedly died during the preparation of this manuscript and who made numerous important contributions to islet cell biology. We thank A. Clark (University of Oxford, Oxford, UK) for valuable and constructive critique and discussion. PR is a Wellcome Trust Senior Investigator. RR holds an RD Lawrence Fellowship awarded by Diabetes UK. Financial supported was also obtained from the European Foundation for the Study of Diabetes (EFSD) and the Medical Research Council (MRC). NJGR is an OXION Wellcome Trust DPhil student. All authors are responsible for and contributed to the conception and design of the study, as well as the writing and editing of preliminary versions of the paper. All authors have approved the final version.